Venerable Master Sheng-yen (聖嚴法師) (1931-) is one of the more famous living teachers of Chan (Japanese: Zen) Buddhism. Master Sheng Yen is the 57th generation descendant of Linji in the Linji (Japanese: Rinzai) School and a 3rd generation descendant of Master Hsu Yun. In the Caodong (Japanese: Soto) lineage, Master Sheng Yen is the 52nd generation descendant of Master Tung Shan (807-869), and the direct descendant of Master Tung Chu (1908-1977). Born near Shanghai, he became a Buddhist monk at the age of 13. He went to Taiwan in 1949, and from 1961 to 1968 he trained in solitary retreat. He studied for a master’s degree (1971) and doctorate (1975) in Buddhist literature in Japan. 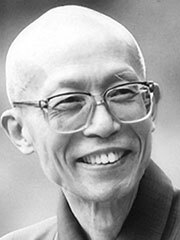 He became abbott of Nung Ch’an Monastery in Taiwan in 1979 and founded of the Institute of Chung-Hwa Buddhist Culture in New York City in 1980. In 1985, he founded the Institute of Chung-Hwa Buddhist Culture in Taipei and the International Cultural and Educational Foundation of Dharma Drum Mountain in 1989. He has been teaching in the United States since 1980, and has also visited many countries in Europe, as well as continuing his teaching in several Asian countries, in particular Taiwan. In this way his work has helped to bridge East and West and convey the Dharma to the West. Sheng-yen has given dharma transmission to several of his lay Western students, such as John Crook. Sheng-yen, Song of Mind: Wisdom from the Zen Classic Xin Ming, Shambhala, 2004, ISBN 1590301404. Sheng-yen and John Crook (ed. ), Illuminating Silence: The Practice of Chinese Zen, Watkins, 2002, ISBN 1842930311. Sheng-yen and Dan Stevenson, Hoofprint of the Ox: Principles of the Chan Buddhist Path As Taught by a Modern Chinese Master, Oxford University, 2002, ISBN 0195152484. Sheng-yen, There Is No Suffering: A Commentary on the Heart Sutra, Dharma Drum, 2002, ISBN 1556433859.